This weekend my love had a birthday. And, mine will be here in a couple days. We took ourselves out on a date. It sure was a nice present. I know dating isn't necessary for real love & romance. It's a pretty sweet thing. We live on the coast. But, we don't actually go to the beach very often. Scott doesn't like sand on him. Pacific Coast Hwy a few weeks ago at the time of the sunset. The sky was partially cloudy. The sunset over the ocean was gorgeous. we ought to swing by the beach for a sunset walk. It had been raining all day. So, even I didn't want a sandy walk prior to dinner. Scott agreed to a paved coastal walk. But, we seemed to have missed the sunset by a few minutes. I'm not sure what happened there. I even looked up the time of the sunset online. We ate at Cafe Cruz. It had been a long time. It's so good to go out for good food. Except we both felt sick from gluttony afterward. It's not that I don't trust him. I do. It's not that I feel bad about leaving the kids with him. I don't. The thing is, I don't ask him to babysit our kids, because they are our kids. They are not my kids, whom he watches occasionally. He's the dad. He's is just as much of a parent as I am. He may feed them something different for dinner than I would. He may do a different bed time routine, when I am not there. We don't do every thing the same. But we are a team. And we are both happy to be active parents. But, sometimes we do things without the kids. Sometimes I go grocery shopping at night. Sometimes I have a wedding flower job on the weekend. Tomorrow morning I will sit for 3 hours at the blood lab. True, I don't just assume he will be here to watch the kids whenever I want. I do ask him. I ask my husband if it will work for him. But, he does the same for me. doesn't mean I am the one who is responsibility for the kids. Scott does not assume he should make whatever plans he wants at any time. If he has plans something he wants to go out & do, he asks if it will work for me. Scott cares for our kids often. But, I will never ask him to babysit them. I remembered to grab the old place settings from my garage. These ones - the bundles of wheat I made years ago. But, there are numerous children now, who didn't have a wheat bundle. So, when we got to my folks house, my sister Lizzy & I had to come up with something quick. Something the little tikes would be excited about. We needed to make 5 in about 30 minutes & use whatever we could find. We find some turkeys online made with apples & nuts. We didn't have all the stuff. We sat, there looking around. I spotted these baby pumpkins. We grabbed construction paper & traced the youngins' hands over & over again. We had no googly eyes. Lizzy found these glass vase marbles & made them into eyeballs. We hot glued the hand/paper tail feathers to the bottom of the pumpkin. Hot glue the eye balls above the pumpkin stem. I cut a little wattle from paper & hot glued that under the stem. Gillian loved hers & was carrying her baby turkey around this morning. The little one was named Gobbley. & stripped off all the turkey parts. This is probably the only sewing I am doing for Christmas gifts this year. A heap of bean bags. Actually, they are rice bags, not bean. They are too little for beans. & a set of alphabet bean bags. Might as well give them school stuff while they are in love with learning. we did a little holiday photo session in our backyard. We're sending out a few Christmas cards this year. But these Night Owl cards are hard to resist. It is thunderstorming outside right now. Hail coming in sheets. Booming thunder. Bright lighting. This is really exciting stuff around here. And it is feeling cozy in this house. Felted acorns bought from Etsy a couple years ago. Flashcard in the background is from my Italian alphabet cards. Project courtesy of Tina of Paisley & Lace. 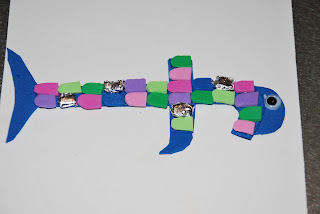 I glued Lentils & Split Peas on the felt leaves she cut for us. Pom Pom Toms I made years ago, trying to follow Martha's directions. I prefer the little guys to the big fatty. We got up this morning & it was cold & overcast. All week it has been quite warm. So, we figured it would warm up soon & we would go for a walk. It stayed cold & dark all morning. So, the kids & I built a fire instead. Then we just hung out & played. After dinner, we roasted marshmallows with Daddy. Embrace the Camera with me & link up over at The Anderson Crew. after the complex fish letter. Phew! We didn't really do any intense learning this week. We watched the documentary Winged Migration. We looked at books about geese. But, mostly we read Mother Goose nursery rhymes. And we did some of our own rhyming word practice. And, we did Mother Goose activities. We baked Hot Cross Buns. We may make "pease porridge" tomorrow. And the kids did a dramatized puppet show of Jack & Jill. We video taped it. But, I don't know how to get the video onto my computer. We made paper bag puppets & finger painted the back drop. They practiced their lines & preformed for daddy. Gillian & I took a little big girl date yesterday. She got a hair cut at mommy's hair salon. She now wants to be a hair salon lady when she grows up. She's planning to blow dry & brush my hair for me today. to get her a pair of jeans. I've needed to get her new pants for quite some time. if she didn't want her bottom to show. We found some pants that can keep her covered. & racks of frilly tutu skirts. instead of expensive Christmas bling. Gillian ooohhed and awed over all the treasures. She was amazed by the golden jewelry. Then we picked up dinner & brought it home to the rest of the family. She was glad that bed time was soon. She said she was exhausted. I'm learning to Embrace the Camera. You can do it, too. Link up with Emily at the The Anderson Crew. I can't seem to stop cleaning. It feels mentally good. But, it wears this girl out a bit, too. Her excitement over things being cleaned all the time could be called "giddy". She's declared numerous times how nice it is for me to clean. She loves the smell of clean rooms. The other day I had mopped with Pine Sol while they were taking their nap. I was resting in bed when she woke up. She came in with me & related the way that she felt upon waking. "Something smelled so sweet. It woke me up & it felt so nice for me." Kendall has kicks that our strong enough for the kiddies to feel. They like to try to get her attention - talking to her & rubbing my belly. she said, "I wonder if Kendall doesn't know that I am knocking on her door?" Scott's Pineapple Guava were just ripening. The kids want to check the bushes every day now. I am very addicted to this Apple & Curry Quinoa Salad right now. I make it multiple times a week. Right now I have foccacia rising. We'll eat Spaghetti for dinner. Scott & I have a movie for tonight. for my large, achy self. I won't ask Scott to bring the tv into the room. I am super anti tv in the bedroom. But, a big ole bed sounds nice. I think I'll blow up the guest aerobed & make a bedroom in the family room. That makes movie night sound one hundred times more wonderful. Baby Mo is waking. That means this post is over. I am now in the third trimester. I started feeling a bit third trimester-ish a couple weeks ago. So, it is good to actually be there now. I feel sore with all my spreading ligaments & all that sort of third trimester stuff. I get worn out so easily. But, the nesting has set in. & feeling rather bored of the blog world. Peyton has also been working on getting things looking lovely around here. Man. This alphabet craft card was tedious. But, the kids love it. Everyone knows Rainbow Fish, right? He's the most beautiful fish in the sea. rather than hoard them to yourself. 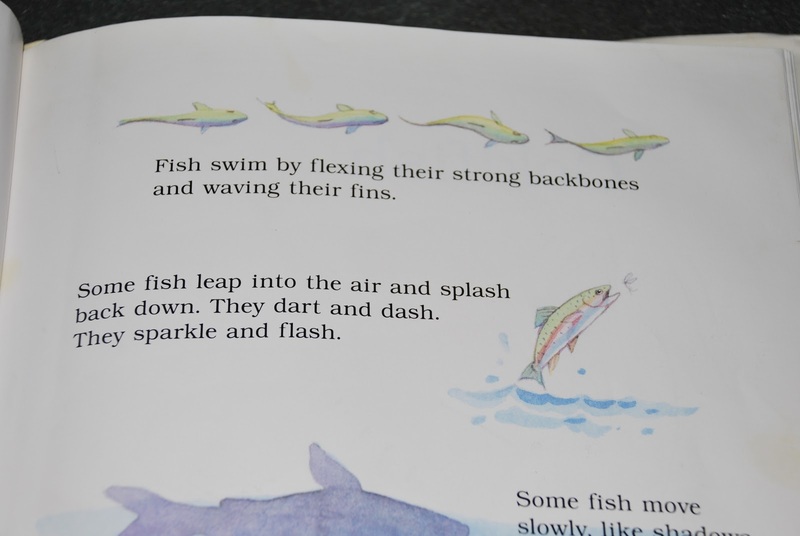 Cute story about a fish & a tadpole friendship. The fish learns to be content in his fishy state. This is the first of the Crinkleroot Jr. Nature Guides that I have seen & I loved it. The pictures are beautiful. I want to see the rest of the series. They listened & looked for the letter "f" as I read, then circled them all. 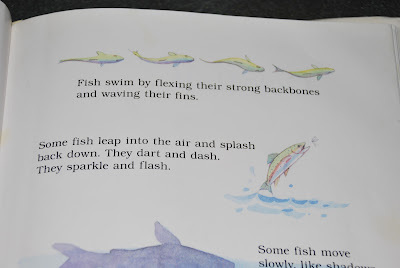 The foxy freshwater fish tried to avoid the fly fisherman. Those four friends feel like their fried fish fingers are a foodie feast. The freckled frog freaked out when his fort caught fire. then we played follow the leader & Simon Says. 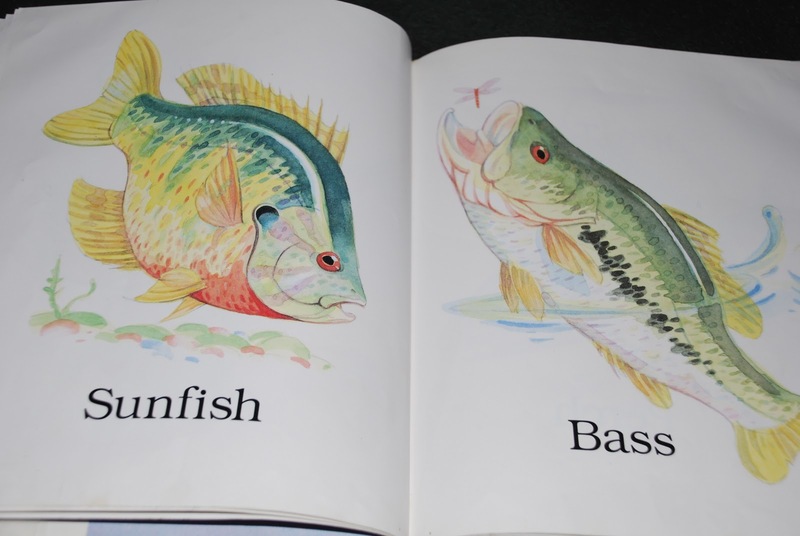 Check out a little lesson on the nursery rhyme here at First School. 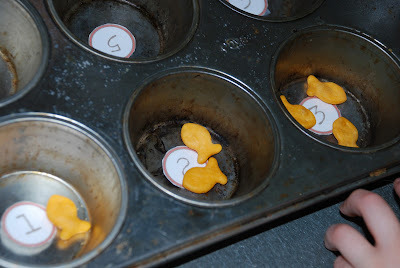 counting goldfish crackers into a muffin tin. 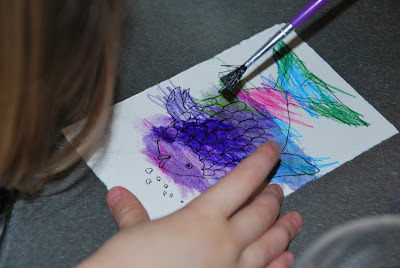 I drew a rainbow fish for both of the kids onto watercolor paper. 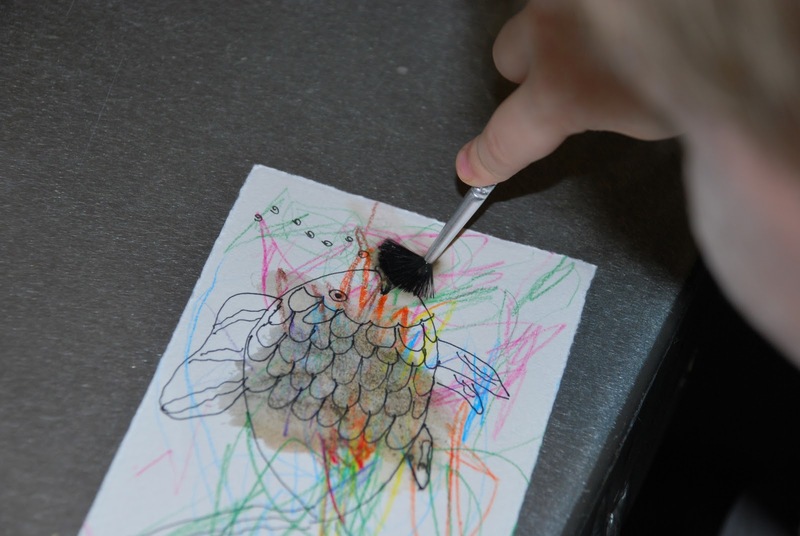 then a wet brush to paint their fish. Watercolor pencils make for a tidy painting experience. Then mom added some glitter spots for some shimmer. But, baby Mo was quick & dumped a whole bottle of glitter all over the table. We were the sparkle family. * We were out of town for fish week. So we didn't do tons. We will just have a review week this week & jump into the letter "g" next week.